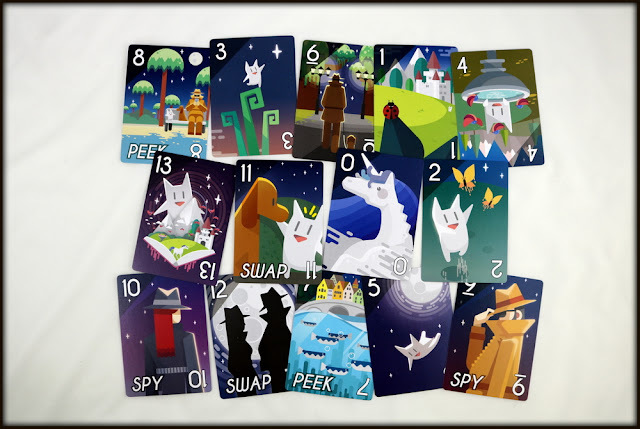 Spy, swap, and peek to find Cabo the unicorn in this simple card game. 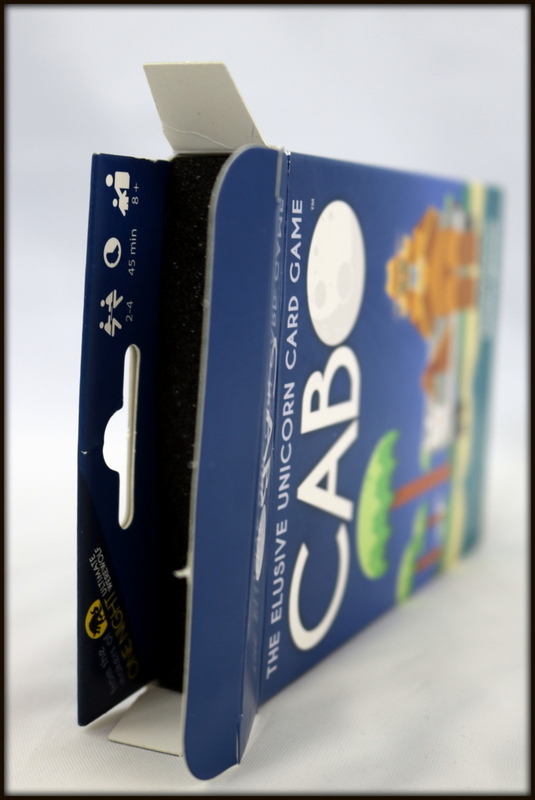 Your goal in CABO is to minimize the total value of your cards, but you don't know what all your cards are at the beginning of the game. 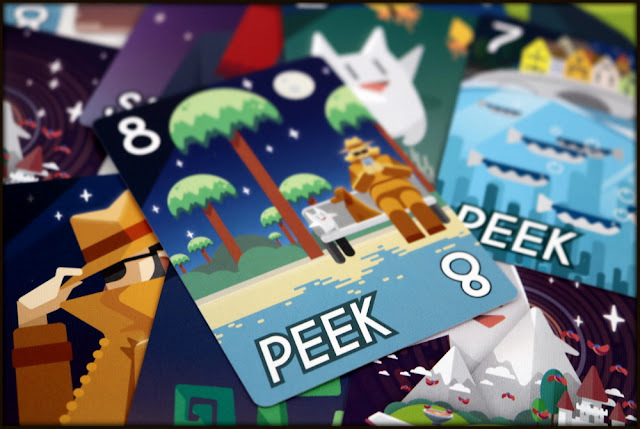 By using certain powers to peek at your own cards, spy on your opponent's cards, or swap a card with an opponent, you can try to minimize the value of your cards. When you think you have the lowest value, you can call "CABO" to end the round, but everyone else gets another turn. 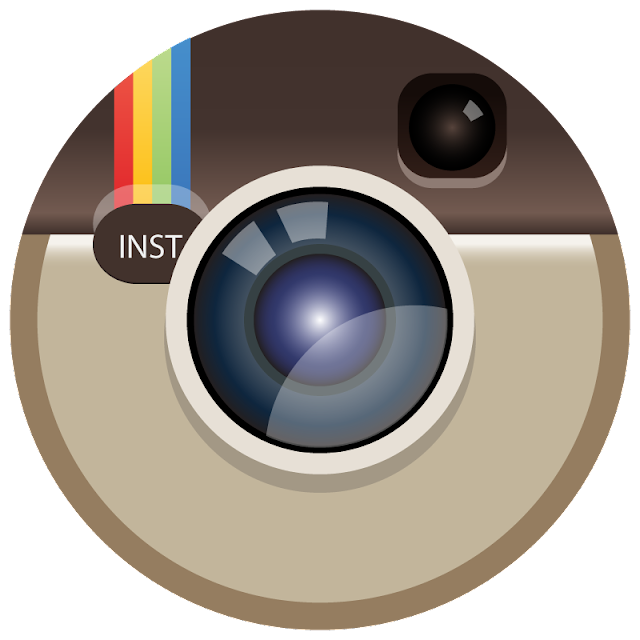 In the end, the player with the lowest total wins; can you shed your cards quicker than your opponents? 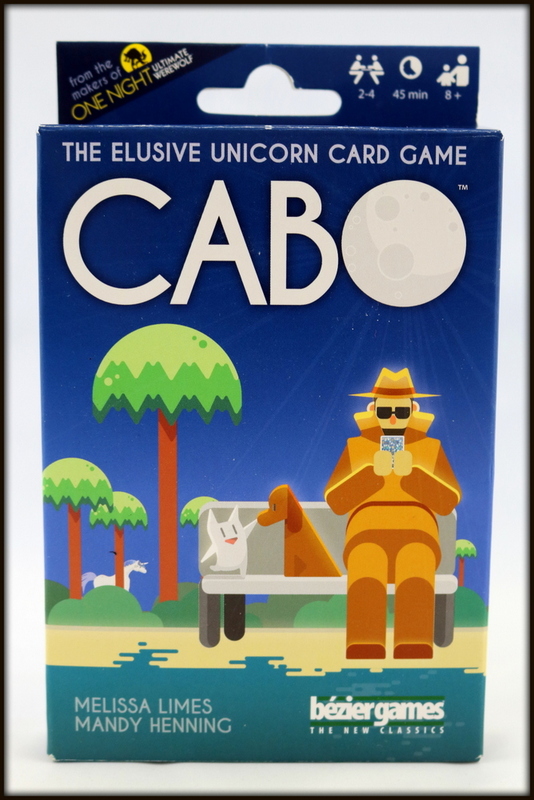 Cabo is a classic-style family card game, similar to Golf (played with a regular deck of cards) or Rat-a-Tat Cat (marketed towards kids). 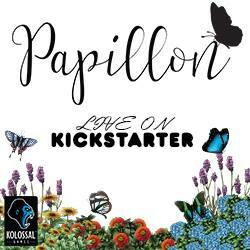 This new second edition of the game has eye-catching artwork and a few extra rules that add to the interest. According to the rule sheet, players are trying to find CABO, the mythical unicorn! There is a little spying and sneaky work going on as you try to close the gap by lowering the total on your cards, but in my opinion, the theme is less important than the basic gameplay and the striking art. Cabo is quick to set up: shuffle the deck of 52 cards, hand out player aid cards for those who need them, and go. 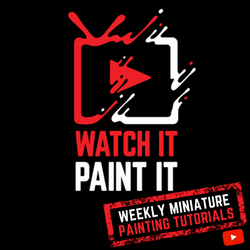 A note about the components...I've already slipped it in twice before this section, and this probably won't be the last you hear about it: we've been swept away by the adorably quirky spy-and-animal themed artwork by Agus Muqith. 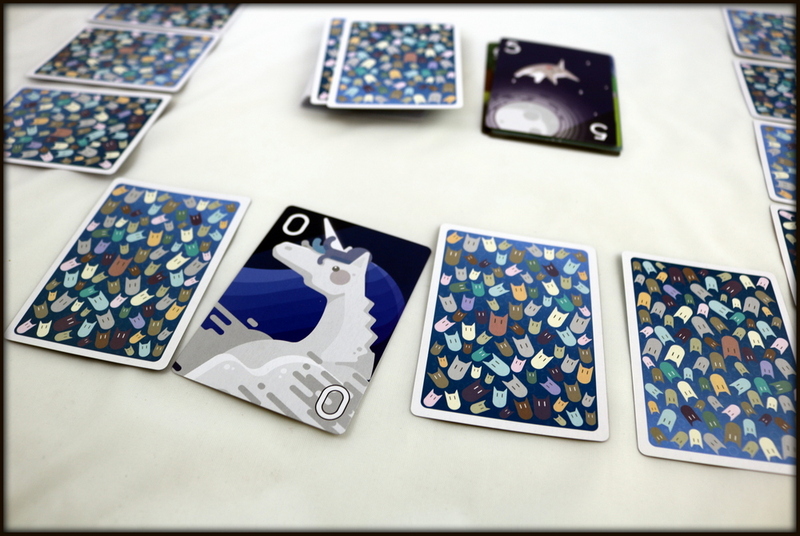 It's just delightful, and the linen-finish cards are a pleasure to hold. My only quibble here is that I have a personal vendetta against tuck boxes...the top flap always gets ripped or bent, the components at the bottom (in this case, a section of foam and the score pad) get stuck or crumpled, etc. Give me a good ol' two-part box any day! The game play for Cabo is based on memory, number sense, and strategy. 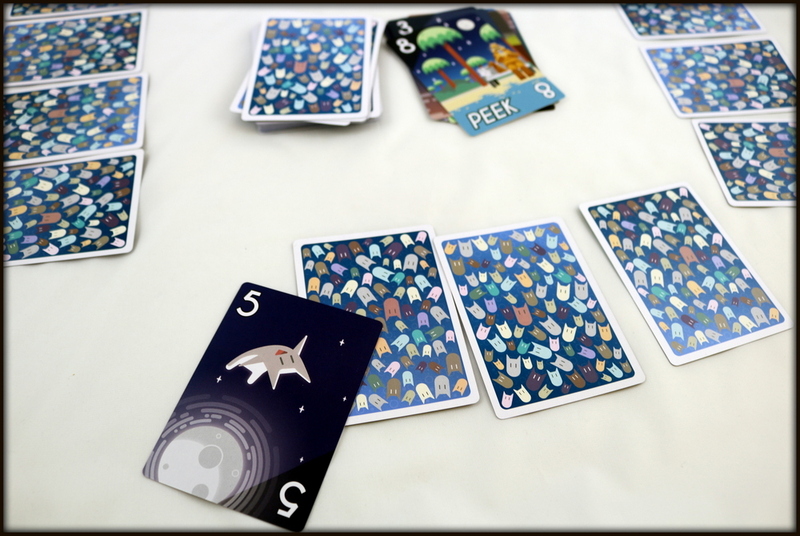 At the beginning of each round, players are dealt 4 cards face down on the table in front of them, and can only peek at 2 of them. 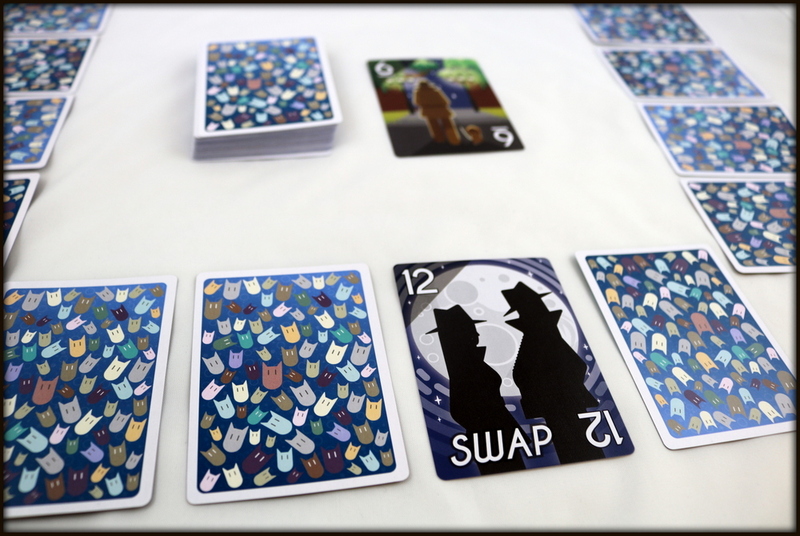 Players take turns drawing from the deck or the discard pile to replace the cards with (hopefully) lower values. When one player feels they have the lowest total on the table, they call "Cabo!" and each other player gets one more turn. All cards are flipped up, and the lowest total wins the round. 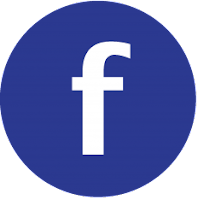 The game continues in a series of rounds until one player has reached 100 points, and at that time, the lowest scoring player wins. 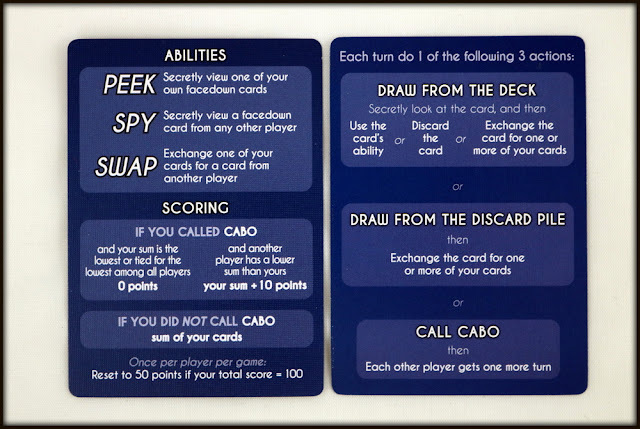 Cabo adds some layers of strategy and interest to the basic game, including cards that allow you to Peek at one of your own cards, Spy on one of an opponent's cards, or Swap one of your cards for one from an opponent's row. 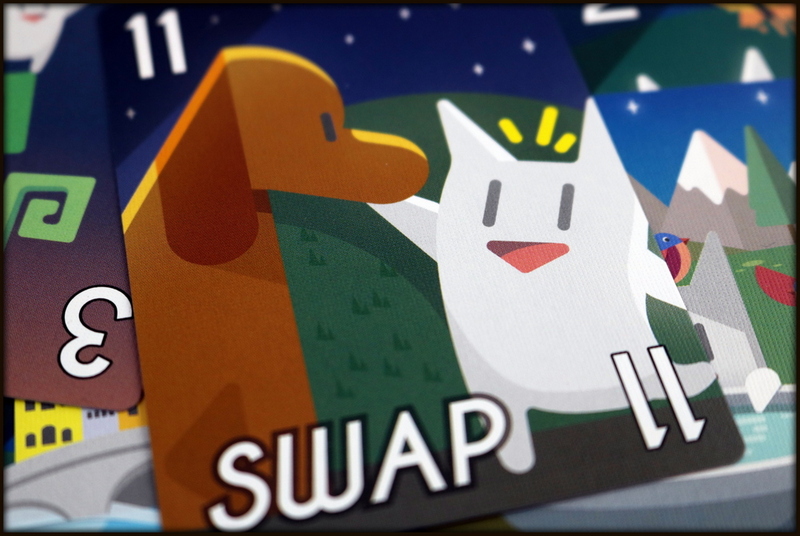 Cards that you pull from the discard pile remain face up, so that although you may now have a helpfully low number, your opponents also know what and where it is and can Swap for it if they get the chance! You also have the opportunity to exchange one card from the pile for a pair (or potentially triplet or higher) of cards from your row... but be careful, because if your memory betrays you and you forget which two cards were the pair, you'll wind up with more cards than you started with! A few extra rules give a little more complexity on the scoring end: the player who calls "Cabo!" will get zero points if they had the lowest total, but will gain their total in points plus 10 if they were wrong about being lowest! A player can also try to Kamikaze by going out with two 12s and two 13s...in which case, they get 0 points and all opponents get 50. 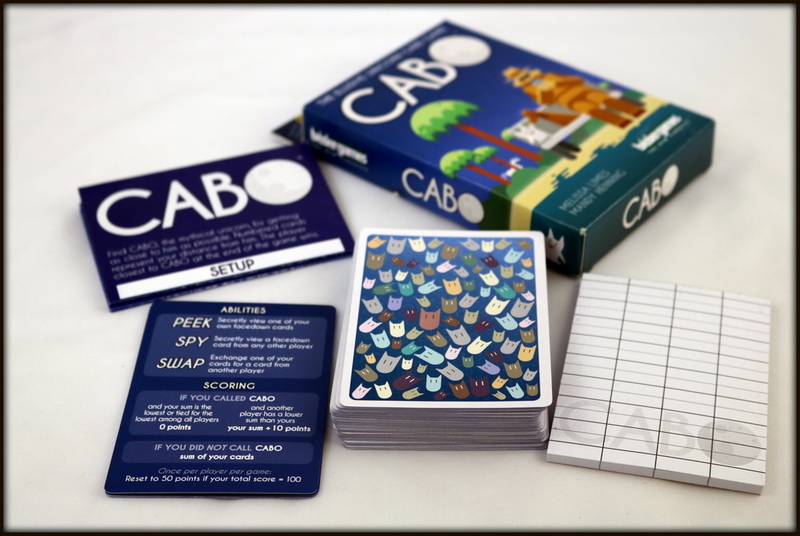 Cabo is a solid family-style card game that is easy to learn and teach, can be played in single rounds if you only have a snippet of time or to the 100 point benchmark if you have a relaxed evening to play multiple rounds. As a gameschooling mom, I love the sneaky skills that are tucked into a game like this: strengthening your working memory as you try to remember your four cards and any of your neighbors' that you've spied; bolstering number sense and an understanding of probability as you compute your total and try to determine if you have a good chance of drawing another low card or not; and perseverance as you work to see the bigger picture of your overall score rather than dwelling on a single loss in one round. The art. 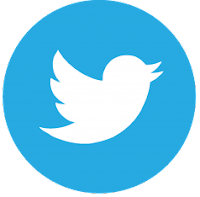 I told you I'd mention it again! The cat, and the dog, and the unicorn, and the spies! 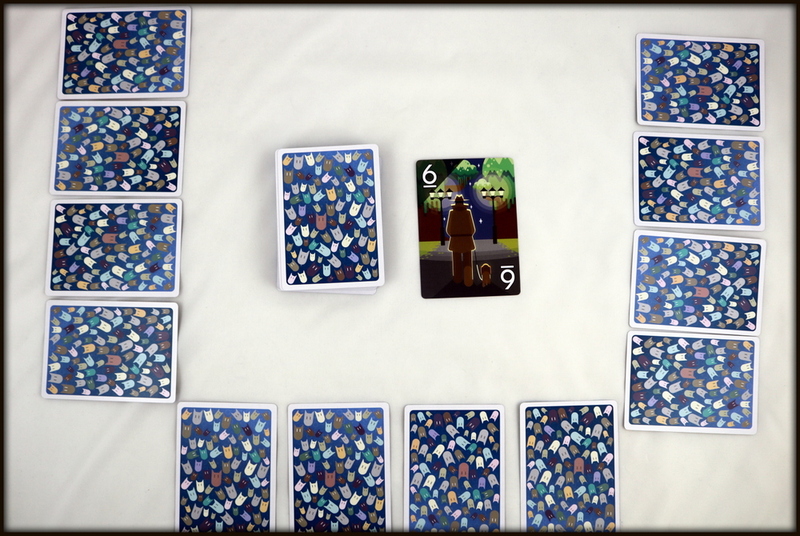 Each card is a delightful mini-story in itself. The tuckbox still bothers me. 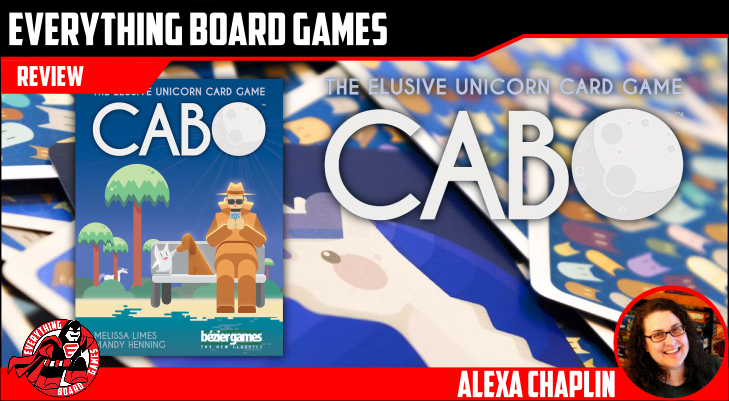 Besides that, Cabo is functionally quite similar to other games we already own or play (Golf or Rat-a-Tat Cat) although there are some rules differences that make Cabo stand out. Not every family will want games so similar in their collection, although my tween daughter feels like the styling of Cabo better suits her age than the more child-focused Rat-a-Tat Cat, so she is glad to switch one for the other. 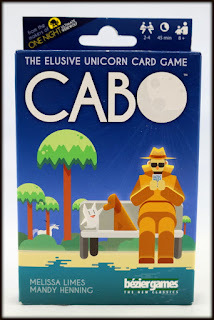 Cabo is a great game for players who already like traditional style card games like Golf, Hearts, or Rummy. It's a good fit for fans of other card games with memory or strategic elements like 40 Thieves, Crazier Eights: Shahrazad, or Dinomals. 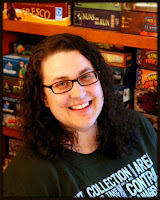 I would be happy if Agus Muqith decided to illustrate modern takes on all my favorite old card games with updated designs from Melissa Limes and Mandy Henning! The art alone gives Cabo a solid place on our family game shelf, and the game play with new and interesting rules makes for a lovely evening of cards.